Multi-image uploader with preview thumbail, progress upload, size remaining, upload speed and time remaining. Drag & Drop into the browser to begin uploading (for supported browsers). Copy all image links to the clipboard button. Copy direct links, HTML code and BBCode. Image uploads are stored securely and assigned a short url. Optionally make this a longer hash via the admin area. PNG, JPG/JPEG, GIF & WBMP. 3FR, AAI, AI, ART, ARW, AVI, AVS, BGR, BGRA, BMP, BMP2, BMP3, BRF, CAL, CALS, CANVAS, CAPTION, CIN, CIP, CLIP, CMYK, CMYKA, CR2, CRW, CUR, CUT, DCM, DCR, DCX, DDS, DFONT, DNG, DOT, DPX, DXT1, DXT5, EPDF, EPI, EPS, EPS2, EPS3, EPSF, EPSI, EPT, EPT2, EPT3, ERF, EXR, FAX, FITS, FRACTAL, FTS, G3, GIF, GIF87, GRADIENT, GRAY, GROUP4, GV, HALD, HDR, HISTOGRAM, HRZ, HTM, HTML, ICB, ICO, ICON, IIQ, INFO, INLINE, IPL, ISOBRL, JNG, JNX, JPE, JPEG, JPG, JSON, K25, KDC, LABEL, M2V, M4V, MAC, MAP, MASK, MAT, MATTE, MEF, MIFF, MNG, MONO, MOV, MP4, MPC, MPEG, MPG, MRW, MSL, MSVG, MTV, MVG, NEF, NRW, NULL, ORF, OTB, OTF, PAL, PALM, PAM, PANGO, PATTERN, PBM, PCD, PCDS, PCL, PCT, PCX, PDB, PDF, PDFA, PEF, PES, PFA, PFB, PFM, PGM, PICON, PICT, PIX, PJPEG, PLASMA, PNG, PNG00, PNG24, PNG32, PNG48, PNG64, PNG8, PNM, PPM, PREVIEW, PS, PS2, PS3, PSB, PSD, PTIF, PWP, RADIAL-GRADIENT, RAF, RAS, RAW, RGB, RGBA, RGBO, RGF, RLA, RLE, RMF, RW2, SCR, SCT, SFW, SGI, SHTML, SIX, SIXEL, SPARSE-COLOR, SR2, SRF, STEGANO, SUN, SVG, SVGZ, TEXT, TGA, THUMBNAIL, TIFF, TIFF64, TILE, TIM, TTC, TTF, TXT, UBRL, UIL, UYVY, VDA, VICAR, VID, VIFF, VIPS, VST, WBMP, WEBP, WMF, WMV, WMZ, WPG, X, X3F, XBM, XC, XCF, XPM, XPS, XV, XWD, YCbCr, YCbCrA, YUV. Preview logic as standard. 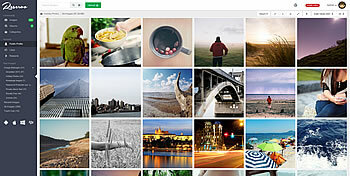 On upload, a 1100x1100px cached jpg version of each image is stored. Thumbnails are generated quicker from this rather than using the original image. Image watermarking options including support for transparent pngs and water positioning. Support for multiple image server storage. 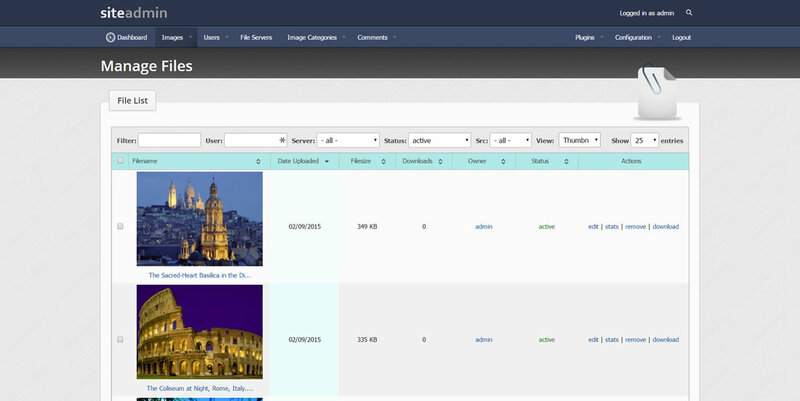 Store images on a FTP server or external dedicated server. 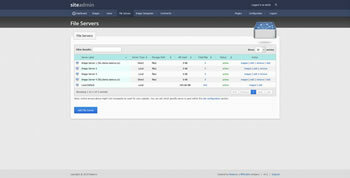 Use based on least used space, random or a specific server. Support for image downloads by remote url. User registration & members area. 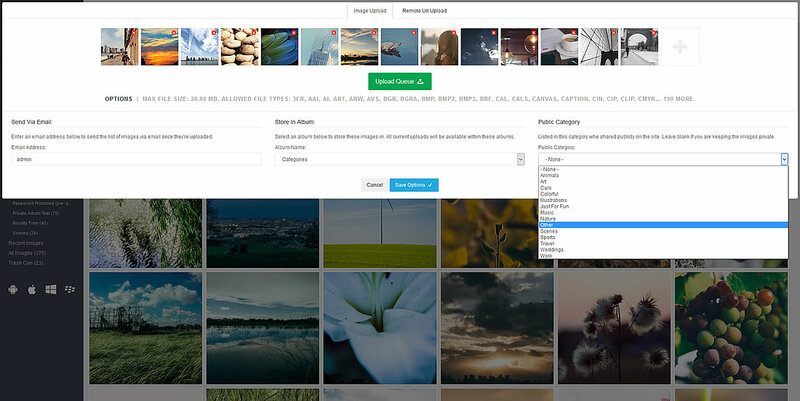 Users can create an account and manage all their image uploads in one place. Fast ajax based image manager built entirely in-house. Full screen, responsive file manager. Full support on mobile, tablet & desktop devices. 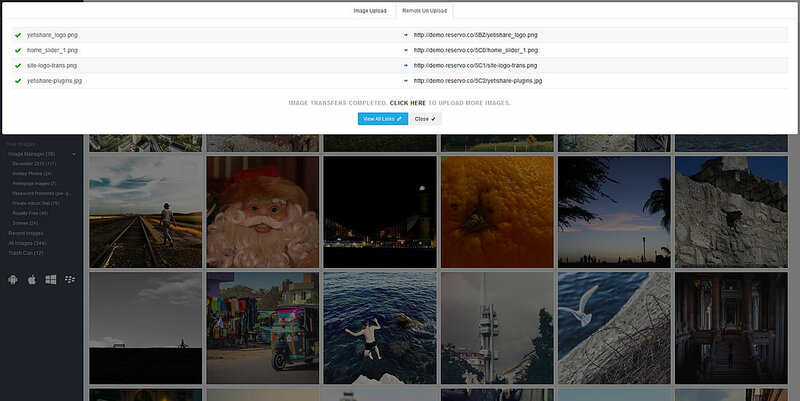 Fast ajax based image manager built entirely in-house. 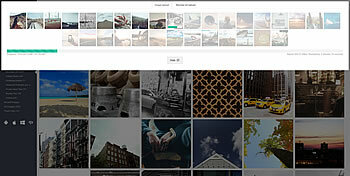 No need to reload the entire site to browse albums or images. Search widget in the header for quick searching. Both on the main website and the image manager. 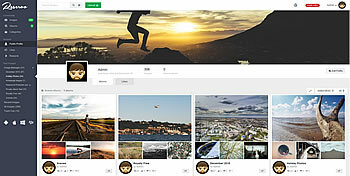 Browse other public images, albums and by image category. Set albums within albums, there's no limit on the sub-album depth. 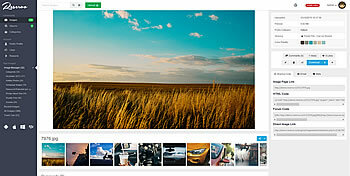 Even share a top level album with users to provide access to photos organised into sub-albums. Large image preview, resized depending on device. Zoom option on image preview to view full screen. Display of any accociated EXIF image data onscreen, like when it was taken, location, camera etc. Options to download the original image or different sizes. Sharing code for forums or your own website/email. Email the image or share via social networks. Comment on the image. The comments functionality is entirely built in, manage, approve, edit comments via the admin area. Color palette which displays the most comment colors within the image. 'Like' button so your visitors can like the image. 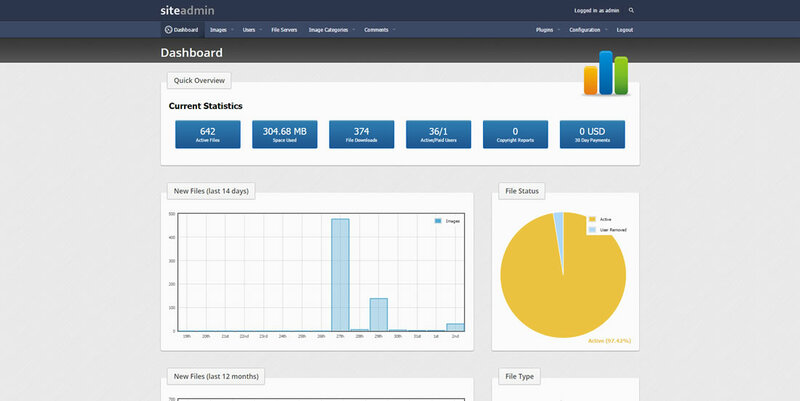 A link to view detailed image view statistics. Pre-caching within the image manager so the image manager is lightning fast. Support for keyboard navigation when viewing images. View a slideshow of any album. If it's a public album, share it with other users/customers. Public - Listed on the site. Limited Public - Available if someone knows the album/image path. Private - Only available via the owners account. 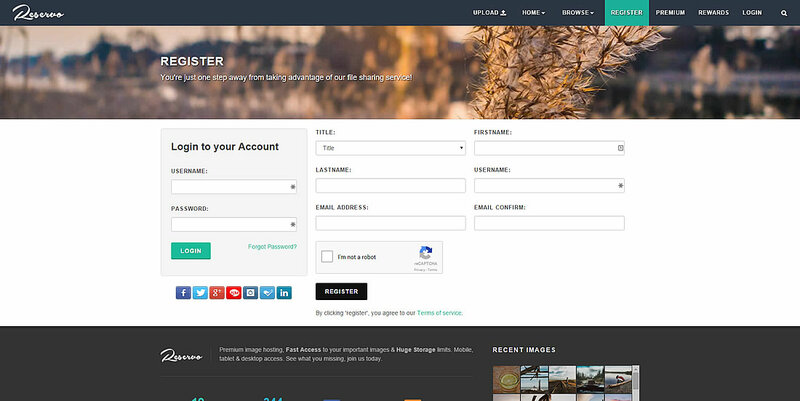 In addition to the above, you can configure the entire site to be private or an entire user account. Albums can have passwords set. Users can not access the album & images unless the correct password is entered. The original images & image thumbnails are stored with a long unique file path so they can't be guessed. Direct browser access denied to the image storage. 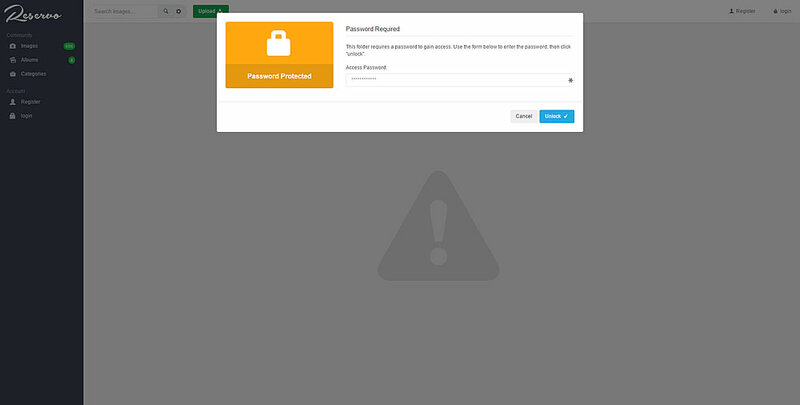 As with the paid user but has access to the admin area. All passwords stored using SHA256 and PBKDF2 key extender. Industry recommended non-reversible method for password storage. IP blacklisting - block IP addresses from using the site. 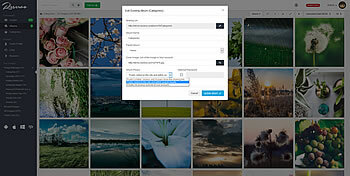 Image type blacklisting - ban certain types of images from being uploaded. Spam protection - Set minimum time between submissions. Spam protection - Set maximum images a user can upload per day. Externally tested for XSS and SQL injection attacks. All image thumbnails cached on your website so they're loaded fast. Support for CDNs such as CloudFlare to improve load speed. Charge for account upgrades. 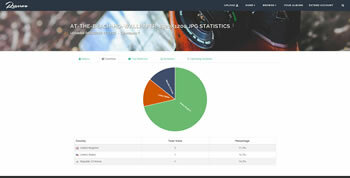 Fully integrated with PayPals automated IPN functionality. 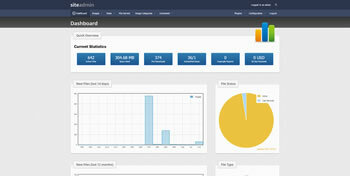 Easy Ads - Use the admin interface to easily integrate your banner ads or Google Adsense code. 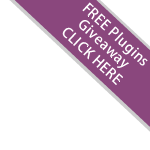 We also have a large amount of plugins available on the plugins page. Social networking icons to share uploaded files on Twitter, Facebook, Email & more. 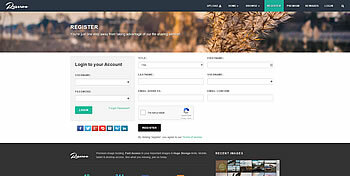 Support for user logins using Facebook, Twitter, LinkedIn & more. 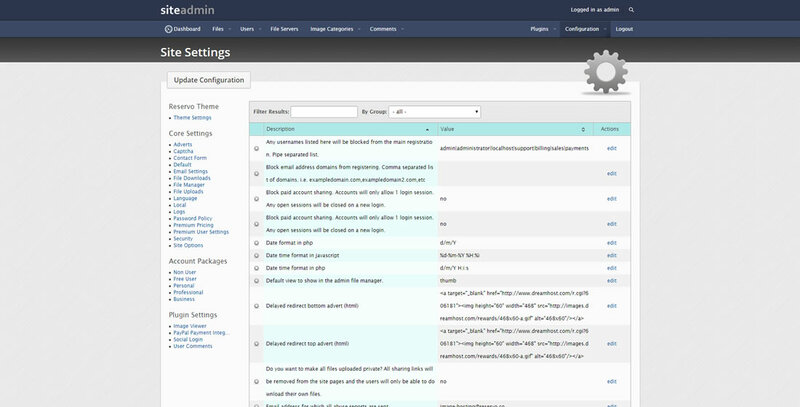 Manage any text content on the site via the admin area. Translation admin tools so the site can be used in most languages. Simple, clean, ajax style look and feel. 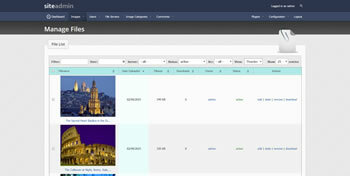 Dashboard detailing image downloads and active images. Search images and view thumbnails directly in the admin area. 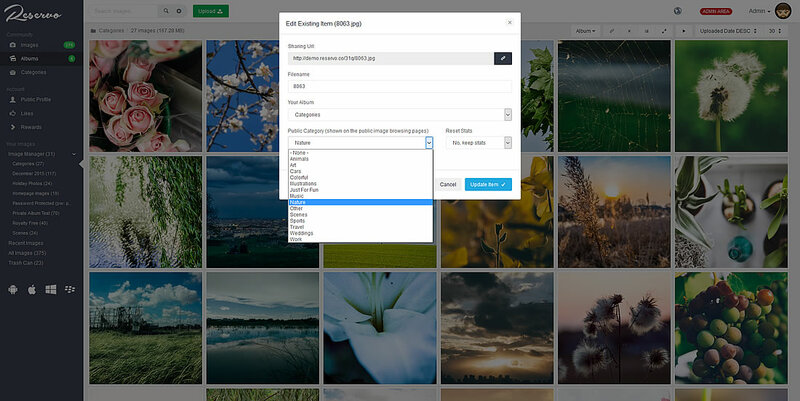 Manage users and filter by user images. 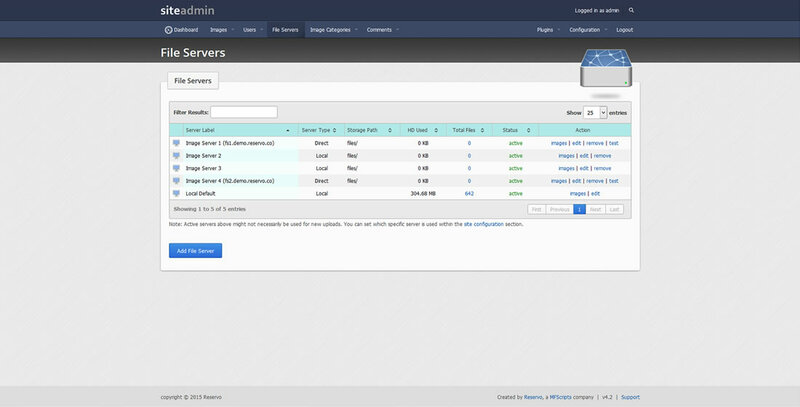 Set and manage image servers. 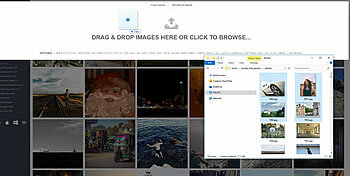 Configure to use specific image server, random or the one with most space. Set paid account packages, rates and period. Amend an account expiry date. Set PayPal email address for site payments. Whether a user can upload. Whether to show the link to the upgrade page. After how long to remove inactive files. Max remote concurrent remote urls. Option to set the filename on the image download url. 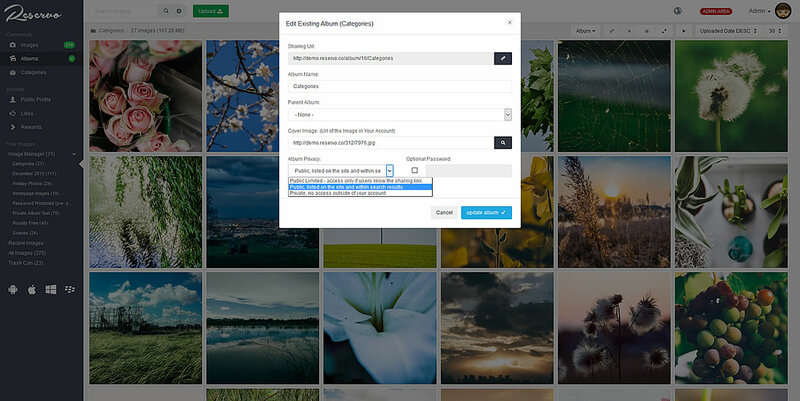 Option to use a different image url than the main site.